QuoteWerks provides the tools necessary for MSPs, IT Professionals, and VARs to efficiently and accurately prepare, manage, and deliver interactive sales quotes and proposals to their customers. With QuoteWerks, you can create quotes in minutes - streamlining your sales. Our complete distributor procurement integration saves you countless hours by enabling you to retrieve your pricing, place orders, track your shipments, and serial numbers. Gain insight into your pipeline - Know when your customers view your interactive quotes, approve the deal, electronically sign the document, and make payment. With QuoteWerks, your opportunities are always up-to-date. 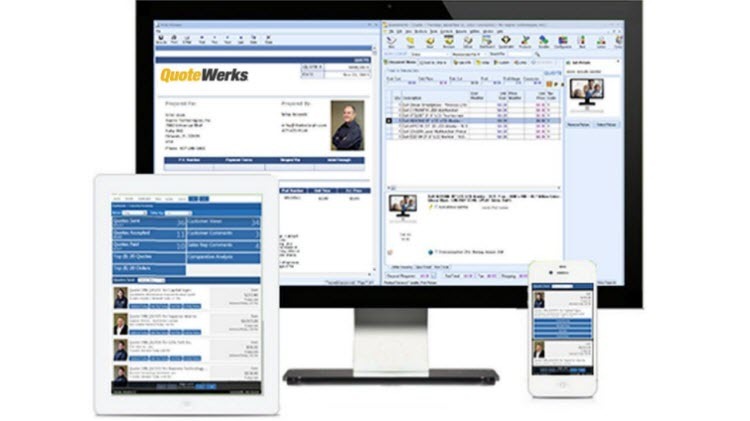 QuoteWerks integrates with ConnectWise Manage Companies, Products, Opportunities, Service Tickets, Sales Orders, Agreements, Projects, Purchase Orders, and more. With over 85,000 Users in 101 countries, QuoteWerks is the Market Leading sales quoting and proposal solution. 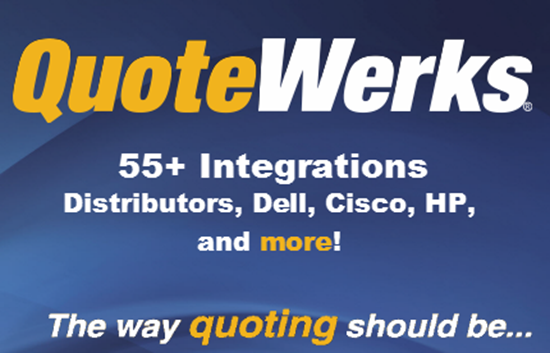 What really sets QuoteWerks apart is it's turnkey implementation, affordable pricing, legendary phone support, and most importantly the 55+ integrations with CRM, Accounting, Distributors, FedEx/UPS, Leasing, Sales Tax, Microsoft Word, Dell, Cisco, HP, and more. QuoteWerks Creates/Updates Completed Opportunity Forecasts in ConnectWise Manage. Creating Attachments in ConnectWise Manage, including proposal PDFs. Create one-off service tickets related to the quote for doing site surveys, pricing research, etc, and then when converting to an order, have options to create a separate service ticket for each hardware item, or labor item. QuoteValet Mobile offering included with QuoteValet quote delivery and acceptance vehicle - no extra fees. Also over 80 payment gateways supported including QuickBooks Merchant Services, Google Checkout and PayPal. Create online order forms in minutes with the QuoteValet Shopping Cart. Use them to automate customer re-orders or receive paid orders from a promotional email blast. Procurement Tracking. Our complete Distributor Integration retrieves your pricing & availability, places electronic orders and tracks your shipments, serial numbers, & receiving. The QuoteWerks ConnectWise Manage Integration is certified via the ConnectWise Invent Program. If you need assistance with creating API members or integration setup please send a note to Help@ConnectWise.com and the ConnectWise Manage support team can assist. For any other questions with this integration, please contact the QuotWerks team directly to resolve any issues. We have been using QuoteWerks for around 4 years now, and it does everything we need at a great price point. Sometimes QuoteWerks feels clunky, but once you learn the work flow or intended use, it makes more sense and becomes quicker to use. Support is awesome at helping me when I am stumped. We sometimes use the ConnectWise feature, and it is nice that we have the option to either use it or not on each quote. QuoteWerks in combination with Connectwise Manage has made our business more productive especially when combining the functionality! This is from two sides of the business. Firstly from the Quote point of view, the product is excellent. the time saved producing accurate, presentable quotes has more than paid for the licenses. The feedback from customers on the quality , detail and presentation of the quotes has not had one negative response in almost 4000 quotes. From a support point of view, the quality of the service and resolution time is second to none. Simple product and Quotevalet is a such a great part of it. Makes quoting so much easier. Olivia Van Nest, Skycomp Solutions Inc. The office loves this application. Easy to get help and very useful product. We have been using Quotewerks for over a decade. During that time what works has always been very responsive, quick to update their software, and support is only a phone call or email away. I get calls from other vendors asking me to switch to their product and every once in awhile I take a look just to see what is out there; every time Quotewerks wins hands down. Quiltworks is continuously developing their product and I look forward to next year's new features. QuoteWerks builds software that just does quoting, but does it really well. I've been a QuoteWerks partner for years, and haven't yet found a business that QuoteWerks couldn't provide a solution for. It's flexible customisation, api and scripting engine, it's excellent integration with ConnectWise, and great customer service make it the quoting solution of choice. We have been using QuoteWreks for a few years now, it definitely streamlines the process! Highly recommend it! QW is a good and cost effective quoting tool. The real time price and availability and ability to create bundles has helped my sales team quote projects quickly and easily. QW integrates with CW Manage to allow my QW quote to flow through CW Manage and automatically create Opportunities, Sales Orders, Purchase Orders, Projects/Tickets and ultimately Invoices. .
David Wrenn, Advanced Office Systems, Inc. Doing quotes with QuoteWerks is easy and complete, we could not do the volume of quotes without it. Their support is also very good and very responsive. There are options there for real time pricing and online quoting and ordering. Quotewerks is the best quoting product I have seen. I just completed my QuoteWerks training and I am blown away with how easy this product is to use. The functionality has made my transition into my new role at Forward Edge so much easier. I am looking forward to using QuoteWerks to complete my daily work tasks. Quotewerks is really a great asset to our company. We love that it integrates with ConnectWise, so it makes pulling quotes together fast and easy. Also, love the speed of tech support when I email! QuoteWerks integration helps us get quotes out to customers quickly and easily! Each time I have contacted support, they have helped resolve the issue/question within minutes over the phone. I appreciate the webinars released with each new update and each new feature added. Technical support for QuoteWerks is excellent. The US based technical support for their software is very essential as it helps our team to get the most out of the new features they are continuously adding. The QuoteWerks QuoteValet feature makes customer acceptance quick and simple. Having to wait for a customer to print, sign, scan and email an approval back to us adds hours even days to a project moving forward. Integration with ConnectWise and auto email notices that a proposal is accepted streamline operations. Recently we have implemented the web based version. The Quotewerks and Connectwise integration has been a total game changer with our company and helps us quickly get quotes out to our customers. The simplicity of everything takes a lot of stress off my back with only having to update quotes in one system and not both. QuoteWerks takes a lot of the "Werk" out of making quotes for us. I would dread having to be without it. This is a great program to integrate your sales into ConnectWise. The quote creation is simple and getting it to the customer is easy. The fact that it can auto create an opportunity in CW and put the products right into it saves so much time for the person that needs to place the order. So far this program has never failed to do what we need and has been great to use. I use Quotewerks on a daily basis and the seamless integration between Connectwise and QW makes my job of ordering and creating quotes so much easier. The layouts are professional looking and the easibility of sending quotes and POs is wonderful. Stephanie Mitola, TAB Computer Systems, Inc.
Ease of use is incredible! Love the user interface and QuoteValet is stellar! Learning how to use QuoteWerks was so easy and fun-- I couldn't love using this quoting tool more. It allows me to customize the quotes just the way I like and plus, the sophistication of the integration with our CRM is on-point!!! The quoting system is easy to install and manage. Quote Valet is a must, the visibility that it offers is unmatched. The support Quotewerks offers is the best in the industry and is enough reason to use Quotewerks as your quoting software. Quoting has never been this simple! Thanks QuoteWerks! Quotewerks is easy to use and understand. Bundles and approvals ensure the correct solution is used! I've been using Quotewerks now for 3 years. The product is very nice. The support team is helpful. Great job Quotewerks! Justin Hayden, Securus Systems, Inc.
Great Product with a great Price Point. A An all in one solution that integrates with all our tools and services. Great integration. Powerful system for a sales pipeline. Very flexible. Great support and customer services. Knowledge of parts and other products we inquired about. QuoteWerks has increased the speed and efficiency of our quoting process allowing us more time to focus on finding more jobs to win. Does the job we need it to do. Simple to use and Quotevalet is a great add-on feature. We have been using QuoteWerks for about 6 years. It has helped streamline the Quoting to Sales process with the automation in CW. I really like the Quote Valet feature where the presentation can be edited to suite our style. Additionally, being able to export the quote to excel helps our procurement department and their daily work requirements. Thanks so much for such a great product! Great product and great support. There are other quoting tools on the market but QuoteWerks has been the perfect fit for our business. The possibilities of QuoteWerks are endless and the support if ever needed is responsive and knowledgeable. We are signed up for the QuoteWerks User Summit March 2019 and ready to take our quoting to the next level! Lee Wagner, Computer Consultants, Inc.
We've been using QuoteWerks many years. Even as a stand-alone quoting tool it's the best. Throw in the CW integration and it's smooth sailing. Best support from any of our vendors. We've been using QuoteWerks for many years and we simply couldn't operate without it. The level of customization you have truly allows you to stand out from the crowd. It's also simple, reliable, and their support is outstanding! QuoteWerks has made quoting easy as it integrates really well with ConnectWise CRM. We have been using QuoteWerks for many years and have enjoyed the product. It integrates well with our other applications and they have a great support staff if we need help. Great product and would recommend it! We have been very happy with the QuoteWerks program and all of the capabilities included. While there are other quoting tools on the market, we have found QuoteWerks to be the most ideal program to use. Wes Jensen, Wes Jensen, Progressive Technology, Inc.
We have been using QuoteWerks since 2004 and have never found a need to make a change. QuoteWerks does everything we want it to do and if we ever have a problem their support is fantastic. We've used QuoteWerks for many years and really enjoy the support we receive and the customization available for our needs. The Etilize integration is wonderful. The Chat feature on the QW website has been a life saver. They have been able to send KB articles and help videos in seconds that always answer my questions. Great feature! David Pope, Next Dimension Inc.
We love QuoteWerks. Every time I contact support I get the answers I need. The product works great. My complaint is with the integration with ConnectWise. Once they switched the API our time from quote to sales order has quadrupled. None of our documents get attached to the orders anymore, we just get errors. QuoteWerks says it's a ConnectWise issue and ConnectWise says it's a QuoteWerks issue. I don't really care who's issue it is, I just want it fixed. I've been using QuoteWerks for about 6 years now. I find that the company is invested in continuous improvement. I always find ways of doing things better by using this software. Great job and keep up the good work! Christopher Opalenik, NIC Group Inc.
Quotewerks Integration ..... two words ..... "LOVE IT". to be able to generate a quote and get it out quickly, all while syncing it to my ConnectWise to keep updated. Fantastic. We've been using QuoteWerks for years and have no intentions of making a change. They keep making enhancements and I'm always finding new ways to use the product. And what matters most..., the quotes that we deliver to the clients are very professional and easy to put together. Great product! QuoteWerks has streamlined our quoting process and allowed our account mgrs. to get their quotes out to clients quickly and accurately. Getting real-time pricing is great! Their support is excellent and we are now starting to use the ConnectWise integration! An all in one solution that integrates with all our tools and services. The simplest, fastest and most feature rich quoting tool i know of. I have used QuoteWerks over the last 4 years and multiple managed service providers. Having a simplistic layout has sped up the quoting process, and training additional users has been quick. QuoteWerks is by far the best quoting tool on the market for IT service providers. We have been users for over 4 years and love it. You can highly customize every aspect of the program to perfectly tailor your quotes for your target market. Their QuoteValet is an awesome tool to professionally deliver quotes to clients. The integration between the two software packages is excellent and Quotewerks customer service team always goes above and beyond! We've been QuoteWerks users since 2007 and ConnectWise users since 2016...it's hard to imagine a more complete or efficient way to generate quotes, much less continually update related information in ConnectWise Manage than through the integration between these applications. Aspire has always been responsive when we had questions and have incorporated our ideas/suggestions into the product development. The tools work well to provide a complete quoting, purchasing, and invoicing solution. I have been using QuoteWerks for over 9 years now. It is very easy to create quotes and send them out to the customers. As a purchasing professional I love the Etilize add on. It allows me to obtain real time pricing and availability of product. We've been using QuoteWerks for several years, after having used Quosal for a few years before that. QW is not fancy but has been much more effective and efficient for us. The integrations to ConnectWise, Etilize and other systems have handled all our needs. The desktop app is very responsive. The templates for both quotes and the QuoteValet landing sites were quite easy to customize ourselves. Their sales and support teams are amazing - super fast response and always helpful. Coming from a different quoting tool, I appreciate QuoteWerks integration with ConnectWise and ease of use. I like being able to pull products from Etilize and compare vendor availability and pricing within the tool. We use QuoteValet for delivering quotes and for customer acceptance which makes the purchasing end even easier. Solid solution for quoting and selling. QuoteWerks saves us so much time in getting accurate descriptive quotes to our customers fast! Dan Scott, CDN Partners, Inc.
Good product with constant updates. Integration with ConnectWise is pretty good and they are working on making it better. Etilize addition is key to satisfaction. Have been using QuoteWerks for 15 years. Great product with terrific support. The cost is very reasonable compared to some of the competition. Combined with the Etilize and QuoteValet Modules I have shrunk my quote turnaround time down to the time it takes me to do product research. Very happy. Being able to generate a professional quote in Quotewerks and it automatically syncing to ConnectWise is brilliant. I love the option to put images of the products your quoting, it makes quoting simple and easy for our clients. We have only touched the surface of what Quotewerks can do and we are loving it so far. QuoteWerks is awesome! We use it for all of our quoting and wouldn't consider anything else. Thanks! Gary Gwilt, GroupOne Consulting, Inc.
We have been using QuoteWerks for years as it integrates really well with our ConnectWise CRM. We also utilize the integration of QuoteValet which has made acceptance and payment of quotes go from days to minutes. QuoteWerks has made quoting easy! Excellent product with even better support. We are integrating QW more and more into our processes as it works so well and makes our lives easier! QuoteWerks is easy to use, is really a one stop shop for all your needs. You can easily customize and communicate. Our company won't use anyone else. The support staff is the best, always willing to help, very knowledgeable and won't give up till you are comfortable! Love this tool, makes quoting and presentation to client a breeze! CW integration is fabulous, and Quotewerks Integrates with disti's for real time pricing, and the ability to import any quotes from Excel format is brilliant. It's not fancy - it's not flashy - but it works like a champ and allows us to quote everything we need to do as a successful growing company. We love QuoteWerks and believe it's the best product for all businesses looking for a quoting tool! Christine Lanning, Integrated Security Technologies, Inc.
Angel Rojas, Datacorps Technology Solutions, Inc.
We love QuoteWerks. It is by far the most affordable quoting tool out there and is flexible! Sales and Post Sales process has been very professional and great people to work with. Individualized attention and genuine care. Features are great. Wish I had bought it a few years ago. Makes life a lot easier. Brian Gregory, Network Innovations, Inc. I've been using QuoteWerks for several years and can't imagine living without it. Quotevalet makes life easy! Rochelle Coulombe, Blueshift Computer Technology Inc.
QuoteWerks has helped our company sell product and make money in countless ways. It is so easy to use and the Quotes look great. They always come so professional and even with photos for the clients. I love QuoteWerks and now that I have it integrated within ConnectWise, I love it even more. Now I feel like a foutune 1000 company providing a great experience for my potential customers and client. The integration was easy and user friendly. I love my combined power that the combined solution has afforded me. We have just recently switched to Quotewerks from Quosal. The difference is night and day. Comparing ease of use, easy to setup, and being much more cost effective i don't think there is a comparison. The biggest plus is the support. Quosal support is awful at best and the software itself is extremely buggy and takes a long time to load any action you make. The speed and excellent compatibility with Connectwise really makes Quotewerks stand out and the rich beautiful quote templates top it off. Its also much easier to make quote templates in Quotewerks. I can't wait to learn more features and even more efficient ways to get the job done! QuoteWerks is very easy to use with outstanding results. Support for the product is second to none. Seamless integration with Connectwise. Simply put, Quotewerks helps us make money. There are other products that do similar things, and to be honest, there is a lot of overlap of features. To that end, most will accomplish the task of getting a quote out to the customer. Cost is another factor, but compared to the overall cost of labor, it is not that much different. To us, the key is support. If we have a problem or not sure how to do something, being able to get someone on the phone right away is very important to us and Quotewerks delivers on their support service. Gary Meszaros, Global On-Line Computers, Inc.
QuoteWerks is the best thing since sliced bread. We have been using QuoteWerks since 2006 and just love it. we have tried some others in the meantime just to see how they compare and we can’t find any other software that can do what QuoteWerks does. The features are rich, the support is fantastic and product is rock solid. Its one of the few products I will actually write a comment about, it’s that good. QuoteWerks integrates into the tools we use, ConnectWise and Connectbooster, as well as enables us to easily get vendor pricing and quotes into the proposals we write. 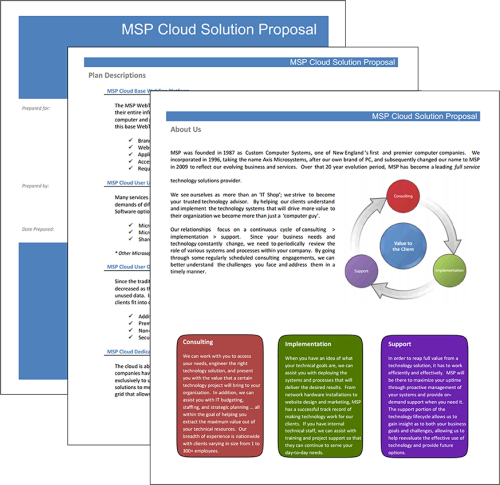 This integration makes the process of preparing proposals significantly easier. Clients like the format of the proposals, the online access through QuoteValet and the ease of payment. Their tech support is excellent and responsive. Can't recommend them highly enough. We have worked with the QuoteWerks team since 1998 and they revolutionized the IT Integrator market back then with a quick, easy to use solution unlike any other available at the time. Today, they continue that tradition with frequent updates and improvements to the system enabling us to price things faster, better and get our customers to sign off quicker. The program performs well and support is outstanding and quick. Bottom line, this is the kind of long-term relationships we look for in Partners. Quotewerks gives us a very professional look and automates and integrates very well with our systems. The quote valet tool has been a Godsend to processing orders and receiving payments with the least amount of work/effort! Quotewerks has really cut the time I spend wrting and following up on quotes. The live data feeds from my distributors and ability to search my ConnectWise products have reduced the amount of work involved in putting a quote together. Once the quote has been accepted, the items flow into the sales order or service ticket and my invoicing is easier too. Highly recommend this addition. Greg Hall, Keystone Management Systems, Inc. I have used many tools over the years in my business. One of the most useful is QuoteWerks. An interesting sidebar, is that I have not even logged into Excel in over a year now, which is one tool I used for over 20 years. I do not fully use all of QW features but the integration with ConnectWise is something I use everyday. I would and have recommend this software to any ConnectWise users out there. Troy Rhodebeck, Revolution Group, Inc. I've been using Quotewerks now for 2 years. The product is easy to use and very customizable. I rarely have to use the support team, but when needed, they are easily reached and helpful. Great job Quotewerks! We recently purchased Quotewerks based largely on the recommendations of peers in the industry and the competitive pricing. Because it hasn't yet been fully implemented, I cannot yet fully review the product. I do want to at least call out the surprisingly prompt & competent technical support that has been offered thus far. Thank you Quotewerks for making the sales process & installation so smooth! Eric Olmsted, On Line Support, Inc.
We have been using QuoteWerks for about three years and longer than we have been using ConnectWise. The integration between QuoteWerks and ConnectWise is why we selected ConnectWise when changing out PSA software. QuoteWerks is easy to use and very customizable. We are able to get real time pricing from all of our distributors and some of the big box competitors. QuoteWerks support is very responsive when we need help. Quote Valet has been instrumental in shortening the time it takes for a customer to approve a quote and it has increased our communication so that when a quote is accepted the billing department knows and can bill the customer instantly. We depend on QuoteWerks for all of our Quotes and love using it. QuoteWerks has helped our company sell product and make money in countless ways. We've done everything from line-item quotes to full project plans and statements of work in QuoteWerks and have had nothing but success. Highly recommended product! Quotewerks has been amazing! I actually enjoy quoting now. We can now search products from Etilize, quote them, and convert to an order. All products are then created in CW's Products page, and items are added to the ticket. Purchasing is simple in QW, and automatically creates PO's and even submits to our suppliers. This directly saves me hours of work. Our clients love the great looking reports, and our staff know where to see the quotes when preforming the work. QW With Etlize and Connectwise makes the ultimate tool for IT/MSP businesses. Just add your accounting package andyou dont need anything else. QuoteWerks has really helped our company unify our Sales quotes. It has also provided the flexibility to make quotes and proposals our own. 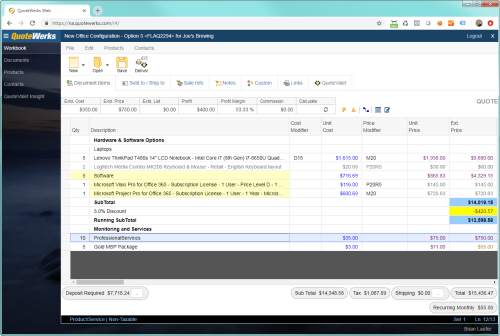 Having the integration into ConnectWise makes sure the quote and invoice match and help minimize errors. Their support has been very responsive and helpful. It has also been a great tool for our ordering as well and make sure things are getting ordered and received as they should be. We have been using QuoteWerks since 2004 and absolutely love it! The features that you talk about below have been a tremendous asset to us. The integration between QuoteWerks and ConnectWise is flawless, I use the convert to order option on a daily basis as well as the service ticket creation option. These features have really allowed me to free-up some of my time to focus on more important tasks. Also, having everything flow automatically in to ConnectWise has greatly improved our time-to-invoice. The parts are already a part of the service ticket, there’s no second guessing or manual adjusting that has to come later. I just wanted to share my experience with you, thank you for developing such an awesome product! QuoteWerks was a fantastic addition to our tool set. After reviewing other tools and looking at implementation process and time to market, QuoteWerks offered the most value for the price. Their implementation support was fantastic and the product is so intuitive that it can be set up and running within a few hours! Quotewerks has been great for us. The affordable pricing allowed us to get onboard with a professional quoting solution. We really enjoy how quickly we can provide quotes to our clients. We had an one hour Proficiency Booster today. We have been using QuoteWerks for a while, and recently started using ConnectWise. Our QuoteWerks Tech Support person, Shawn, was great. He was able to quickly and effectively see how these systems works together and the benefits we will have from using them together. He was great to work with and the use of these two systems will make us much more efficient. Quotewerks is a professional software with which we can create quotes easily and effectively.We have multiple options like group items in the quotewerks and we have online quote storage named quotevalet.Using quotewerks, we can prepare quote, product details,updating ship to and sold to information.update sales tax. Quotewerkscan be integrated with MS-CRM, quick books, connectwise, etc. Improved vendor management is another key benefit.When meeting with our vendors, we can have a much more meaningful discussion on issues.“We can also review activities each salesperson has for that particular vendor along with open opportunities and lost quotes.Quotewerks helps us build new business when they use more of the system’s marketing functionality. Quotes can be built using products and services selected from external product data source databases such as D&H, Ingram Micro, SYNNES, Tech Data, Sage, Peachtree, QuickBooks, ConnectWise and salesforce.com. QuoteWerks allows users to see cost and availability of products from multiple vendors and select the items accordingly. QuoteWerks approval requirements feature allows sales reps to obtain quote approval before they can print, email the customer or upload to QuoteValet. This can be used to ensure such things as that sales are not accepted below agreed profit margins. It assists in reducing the possibility of errors within quotes by allowing senior members to review and authorise before it is in the customer’s hands. QuoteWerks is one of those products that has no competition. Over and over again we win bids because of the speed and efficiency QuoteWerks and the integration with ConnectWise provide. After thoroughly testing both Quosal and Quotewerks, we chose Quotewerks. The licensing policy is excellent, the program is extremely user-friendly, and QuoteValet brings our quotes to the next level. Definitely the right decision. QuoteWerks has helped us streamline our quoting process while enhancing our professional image. We've received many compliments on our proposals since starting to use QuoteWerks. The technical support has been great and is very responsive. It does what it is supposed to do, and does it well! We installed Quotewerks soon after we installed Connectwise several years ago. It is a pleasure to use and has had very few errors. The minor ones we have found have been resolved incredibly quickly. Good looking quotes, produced very quickly has significantly increased our productivity. We have been using Etilize for over a year and that too has increased the professionalism and our effectiveness. Quotewerks are a fine company to work with. I love QW. It has helped me cut my estimation time in HALF! Quotewerks has delivered on all of our needs for proposal and quote delivery. We have been able to cut the time involved from prospect quoting to client and sales by more than two thirds leaving more time to address other challenges. Andrew Schwarz, Cabling Solutions, Inc. I have be very please with the decision to integrate QuoteWerks into our business. Using Quotewerks in conjunction with Connectwise has increased the ease of quoting and speed up the quoting to job delivery process dramatically. I would highly recommend QuoteWerks. Andrew Schwarz VP. Mitch Weller, Info Advantage, Inc. Absolutely love QuoteWerks, fantastic product from the get go, and when ever we have needed support, we have found it exceptional and beyond the norm in response time and personalization. Can't say enough good things about QW. We have been using QuoteWerks since we converted to Connectwise 4 years ago. We looked at the competition and we thought that CW was doing a better job of development at a lower cost. Our decision has proven to be the right one. In my peer group (HTG) our members constantly talk about how expensive the alternative quoting system is and how little they get for what they are paying. When we add salespeople to QW it is a fair licensing price and our monthly fee does not change. Additionally the development of Quoteoworks Web, Quote Valet and Etlize have really streamlined our quoting system. Every IT Nation Arnie talks about the competition and I look at both to see what is going on. QW still stands tall as the best quoting system for CW available, and it is much, much less expensive. We used Quosal for over a year and never got it to work properly. We spent Over $5000 for consultation with them and still did not get it to work. We started using Quote Werks and in a week everyone was trained and we were up and going. And most importantly it works, but when we have questions we can talk to a real live person! Tony Underwood, Cambium Data Inc.
We have been using Quotewerks for over three years and couldn't be happier. They offer great support and are always adding new features. Then when you throw in the price point there really is no reason to look anywhere else. We have been using QuoteWerks for several years now and the seamless integration with ConnectWise allows our sales team to create opportunities flawlessly, timely and accurately. The support is really excellent, every time I call I speak with a support engineer and I have never hung up without my issue being resolved. We just started using QuoteWerks so I have not even begun to use QuoteWerks to it's potential But it is already making my life easier by saving me time and making the quoting process so much more organized. The support has been great! I truly enjoy doing business with a company that puts customer service first. Quoteworks is probably the best add on to CW hands down. At least it is the one that directly generates profits. The Etilize service is fantastic as well. Highly recommend. This is a great product for quoting. Make it so easy to present a great proposal to a customer. 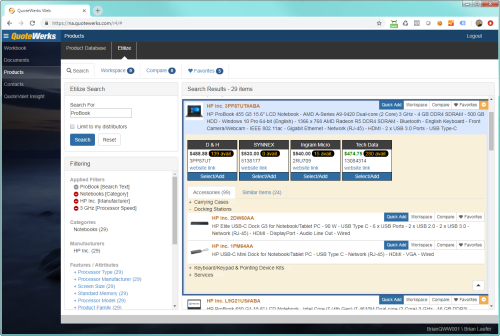 It saves me many hours looking up parts/pricing/availability amongst distributors. That alone made the purchase price worth it. Once a quote is approved you can order right through QuoteWerks and get serial numbers, tracking info etc once it's shipped. Well worth the cost and very low yearly pricing. It's great to see instantly what the profits will be on any quote. We've been QuoteWerks users for seven years. We've found the company to be very responsive to any issues we have. It's not perfect, no product is, but it's served us well during that time. We have looked at the popular alternatives out there, even purchased thinking that something officially supported by ConnectWise would be better. We were wrong. Our productivity with QW is head and shoulders above the competition. We sell a good bit of product, and have a very high conversion rate for quotes, and nothing we've seen beats QuoteWerks! We have been using QuoteWerks for many years now, even before ConnectWise. We love the easy to use interface and features like QuoteValet and the Etilize integration. Their support is outstanding. Great tool for quoting allowing to pull products straight down from the suppliers without having to enter them in manually. Custom in house product set-up and then the ability to post to online portal for review and see if the customer has read it and how many times they have read it. Integrates well with Connectwise updating the opportunities and sending out notifications at every step. Good product all round, Does not even need a server to run, if you have SQL server already and a file share then that's all that is needed! I find QuoteWerks a bit difficult to setup and maintain, but overall I'm happy with it. You really have to dedicate a lot of time to set it up properly, which is difficult for a small business like mine. However, it integrates well with ConnectWise and I like having each sales member product consistent results. Our team loves working with QuoteWerks! We went from using excel to QuoteWerks, a tool that allows our sales team to be more agile when it comes to quoting our customers. The integration with Connecwise was a key component for us to choosing QW. We love the fact we are streamlining orders to opportunities to projects. This is such a great function. Another great reason we went with QW is the support team, they are great to work with and always answer the phone. Love this product and their team! Quote Werks has singlehandedly made selling non-recurring revenue easy and VERY profitable. It has paid for itself 1000 times over (not an exageration, but an increase in actual dollars of gross margin on non-recurring product sales since implementing QuoteWerks a year ago) Quick, Repeatable, Integrated, Process Driven and Profitable - what more do you need - oh yeah - Very Affordable too! Run don't walk. You need the extra profit! We've been using Quotewerks for just over a year now and its been invaluable. It has made the delivery of Quotes to our customers a much quicker and much less arduous process. Customers have clear concise quote that they can accept online. The ability to add or remove optional items often saves us having to do three or four revisions of the same quote. Service is great someone always gets back to us when we have any issues, and Quotewerks seems to have real-world features added regularly. The pricing is reasonable and the product delivers what it promises. Overall its been the best value software product we've ever purchased. When I went looking for a CRM solution, it had to be one that integrated with QuoteWerks. I went from being a QuoteWerks user and occasional reseller until now QuoteWerks is the biggest part of my business. I love working with the team at Aspire Technologies who are continually improving their product. They listen to their clients and partners and the support is excellent. Highly recommended, and would love to sell it to you too! (Doesn't matter where you are based). QuoteWerks has become an invaluable part of our business. Our clients love the experience of QuoteValet and how easy it is for them to review the proposal. We highly recommend the product and the company offers excellent sales and support. We have been using QuoteWerks for about 2 years now. It is a great product. We use it for standard quotes and proposal generation. Very easy to use system and the support if great when we have questions. We can generate quotes faster than ever and we utilize the QuoteValet system to get clients to accept the quotes faster - more sales with less work sounds like a great deal to me. I used to hate doing quotes. I considered it a chore and was missing out on oppertunities because I couldn't produce a quote in a timely fashion. After purchasing QuoteWerks with the ConnectWise Integration and QuoteValet, I'm landing larger deals and it no longer feels like a chore. I use the templates and the investment for QuoteWerks paid for itself in less than two months. I also wanted to praise Michael in the Support department. I installed QuoteWerks on the Terminal Server without first putting it into global mode. i called support, asked a few simple questions and got a few simple answers. I was able to install right over the existing QuoteWerks and go from a single user environment to a multiuser environment in a snap. We have been a QuoteWerks user for at least 10 years, prior to Connectwise and we absolutely love this application. When we decided to move to CW, QW support was a must. Every year this application get better and better, and the support has excelled at every instance. They truly are a partner and they definitely value that relationship, as do we. The more I learn about QuoteWerks the more impressed I am with it and see how it can save us a lot of time and help make our quotes much more accurate and profession. I have also been very impressed with the support staff. They have consistently been quick, professional and knowledgeable. Thad Gerber, Velocity Network Solutions, Inc. Recently we switched to Quotewerks from one of their competitors. We struggled with the previous product's poor tech support and clunky interface. With the previous product, most of the times we engaged support, we were told we had to buy professoinal services. Switching to Quotewerks was one of the best decisions we could of made. Everything about Quotewerks is rock solid and the product is fast and intuitive. The tech support is top notch and I cannot say enough good things about them and the product. We have used QuoteWerks for a number of years and always found it a great tool. It is simple to set up and use. The enhancements over the years have made Quuotewerks a very powerful tool. We've been using QuoteWerks longer than we've been using ConnectWise and it massively simplifies getting accurate quotes together and getting them out to clients. We have just implemented QuoteValet and we are already seeing value in that. We have found the integration between QuoteWerks and ConnectWise invaluable in that we are able to create a Quote in QuoteWerks which updates the opportunity in ConnectWise. When the Opportunity is won then we can create the sales order and ticket with the parts on it and then when the work is complete send it straight through to invoicing knowing that the prices on the invoice are the same as that were on the quote. It saves us hours of time a week. We have been working with Matt Rose (@mattquintadena) from Quintadena to help us get more out of QuoteWerks and his help has been invaluable. Recommended. Email the customer with link to a quote on QuoteValet at 14:44, email back 5 minutes later with a purchase order. Easy. Robert Burdett, Globalnet IT Innovations Ltd.
Good Support, and not overlly expensive but does the job very very well. Many of my clients have commeted on the quality of the online quotes and that they look very professional! Simply being able to pick up the phone and speak to someone that is knowledgeable sets the product apart. How many products can you do that with these days?